There are a lot of cool things going on in this fight. First, the idea of this attack from the Zerg was already an amazing idea. The zerg player Railgan had already scouted that the Terran player ArchangeL was going for a large number of Hellions, backed by some Ravens. A Queen/Baneling drop is set up to do quite well against this. When Railgan first heads to the main base, you can tell the Terran player is aware of the potential threat of Banelings drops because he splits his Hellbats. Instead, Railgan heads to the natural wall. He could have dropped over the wall, but instead he drops his Zerglings and Queens on the outside of the wall. This puts the pressure on the Terran player to group his forces behind the wall to prevent it from falling, and thats when the Banelings rain from the sky. Another cool thing about this fight: if you watch the Queens carefully, they focus fire and kill both Ravens before eventually evacuating safely. But of course, in the end the most damaging part of this engagement is when ArchangeL makes the questionable decision to attack morphing Banelings with all of his SCVs. At one point, every new map maker learns they can change the “gravity” value for their map to make corpses fly (or float) upwards, and implements it in whatever map they happened to be working on, thinking themselves the most clever person for doing it. But not often does such a map make it to the ladder and become so well known for it, nor has the phenomenon been so well-justified by the maps aesthetics: it’s underwater, and the corpses are floating to the surface. I must admit that it can get tiring watching a tournament where Abyssal Reef is played every series, and the observer insists upon making the corpses fly directly into the camera. But every now and then it is a joy to sit back and watch, and TvZ series like this one are amazing for it, with Widow Mine or Baneling connections sending corpses ascending to heaven en masse. Some of the same moments that make StarCraft II so frustrating for some players is what makes it so enjoyable for others. There is something so satisfying in these moments where you surprise yourself with what seems like a chance hit. Then you’re given a few gleeful minutes to revel in the joy of it as the fungus devours the five Medivacs you’ve trapped, before it’s back to the frantic pace of StarCraft’s scrappy battles, and your wobbling Infestors and slithering Hydralisks are fleeing from a force of Terran troops running at full sprint and guns blazing. Where is the air support? Initially this fight looks good for the Terran player, but eventually the loss of those five Medivacs really shows. A force of pure Zerglings devouring a Terran force looks almost cinematically Zerg-like, as each Zergling fights his fellow beats for a chance for a bite of flesh and they writhe and swarm over the dwindling troop of marines like carrion to a corpse. It didn’t come without a cost to our Zerg player Railgan, though: he lost a Hatchery and some Drones before defending this attack. And the timer is running out! It doesn’t take very many volleys from a Lurker to melt Bio even without having to worry about Fungal Growth, Banelings, and Brood Lords. The saving grace for ArchangeL is that there isn’t enough Brood Lords to power through a Planetary Fortress. Having recently picked up a Hatchery kill and some Drones, if he can hold on to his mining he should be fine. 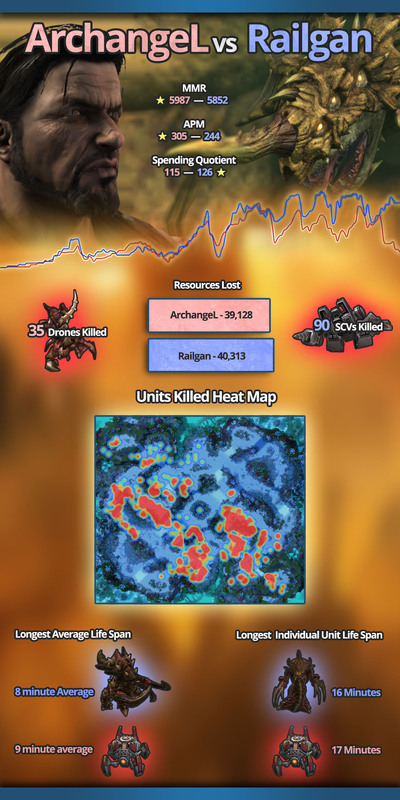 Just as the Brood Lord count was about to rise too high to deal with, ArchangeL makes a move and destroys several key units, leaving Railgan again with not enough to push a Planetary. The Terran has bought a little more time for now, but not his freedom. It’s a bad sign to always be on the defensive against the Zerg: ultimately, their economy can scale so well if left unhindered that defending is losing. Can ArchangeL gain his Wings of Liberty? 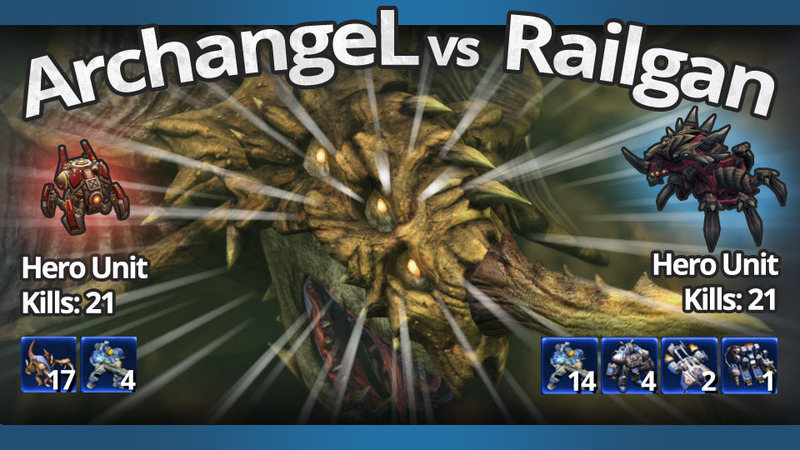 In order to keep the Zerg from gaining an overwhelming advantage, ArchangeL must counter-attack. The best option here would have been several split attacks to tax the Zerg’s multi-tasking and delay him as much as dealing damage, but Corruptors combined with the necessity to build Vikings has dwindled his Medivac count, leaving him with no choice but a direct assault. Unfortunately, it is a risk and one that doesn’t pay off: a failed counter-attack leaves room for a counter-counter-attack from Railgan, dealing the final crippling blow to ArchangeL. They say a picture is worth a thousand words, but a replay is worth a thousand pictures — so simple math will tell you this post would have to be 1,000,000 words long to accurately convey this match! But you know what besides Replays is easier than reading a 1,000,000 word long post? Statistics! Submit your very own replay! As always, we love spotlighting community content, so send one of your own replays for us to spotlight next in the comments, or send a suggestion to us on FaceBook or Twitter! Alternatively, hang out in our Discord chat! Thanks to everyone who supports our replay spotlights by sharing them with friends, commenting on them, or up-voting them on reddit!